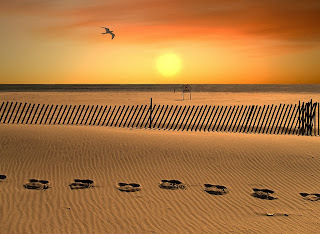 CARPE DIEM HAIKU KAI: Carpe Diem Special #66, Hando's "footprints in the sand"
Carpe Diem Special #66, Hando's "footprints in the sand"
Another week has gone by and today I love to share another wonderful haiku written by our featured haiku-poet for this month, Hando. I have read wonderful haiku inspired on our first Special by Hando written by you all, my dear friends and family-members. This photo did brought a poem into my mind ... a poem about the Lord carrying us, so I have sought for that poem and I found it. I love to share it with you all here at Carpe Diem Haiku Kai. This episode will stay on until December 11th 11.59 AM (CET) and I will post our new episode, Prophecy, later on today around 7.00 PM (CET) !! This Special episode is open for your submissions at 7.00 PM (CET) !! I loved your interpretation and the poem you posted along with your haiku. The prompt took me in an altogether different direction, however. That's what makes this so much fun! I have a journal with that poem on it and was more inspired to write based on that. Both the haiku and that writing are beautiful. I am in your shoes.